Here we will discuss two ways, how to compose SQL Server health check checklist. You can perform all checks manually, using T-SQL Commands, or simply use Automated Health Check from SqlBak. Here it goes. Of course, it’s a bit weird to run this query manually every hour, isn’t it? As a developer, you should probably think about creating some simple application or a batch file that will check the status of your SQL Server and notify you if something goes wrong. SqlBak users don’t need any additional application though. It performs regular checks and sends alerts in the event of service failure. Another thing you need to check is database backups. 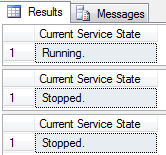 Again, you can do it either manually or with SqlBak. 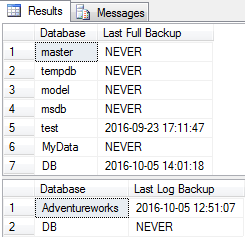 ISNULL(CONVERT(VARCHAR,b.backupdate,120),'NEVER') AS "Last Full Backup"
ISNULL(CONVERT(VARCHAR,b.backupdate,120),'NEVER') AS "Last Log Backup"
However if you use SqlBak to backup your databases, you don’t need to check your SQL Server database backups manually all the time. 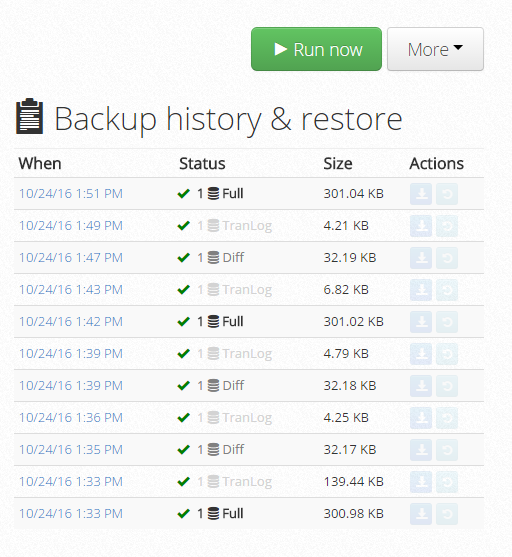 You will be notified automatically if any or your scheduled backups failed. At the same time, if you want to see the status of all backup jobs you can open your Dashboard page and check the “Last Run” column. If the last backup succeeded there will be “Success” sign and if it failed, then “Failed”. One of the trickiest problems DBA may face is insufficient disk space. If you run out of free disk space it will not only slow your server down but also may cause multiple errors and application failures. And the most dangerous thing here is that it may happen when you least expect it (for example in the midst of your vacation). But why not let SqlBak do it for you automatically? It has a nice feature that will perform hourly checks and alert you via email when free disk space crosses the threshold you set. Besides monitoring server’s free disk space you also need to take note of how much free memory is available on your server. If the amount of free memory is approaching some critical value you need to take steps to free it. available_physical_memory_kb/(total_physical_memory_kb*1.0)*100 AS "% Memory Free"
The transaction log is one of the crucial aspects of every database. It is used to keep all transactions prior to committing the data into the data file. Depending on the number of transactions it may happen that transaction logs grow quite large and not knowing what is in the transaction log or how much space is occupied by it can cause some problems. Besides fragmentation at the file system level it’s also possible to have fragmentation within the data and log files, in the structures that store the log, table and index data. This also may lead to a significant drop in database performance. and you will get basic information about external fragmentation percentage and an average percentage of use of pages that represents the internal fragmentation. And as shown in the screenshot above, SqlBak’s SQL Server Health Check also provides information about index fragmentation. Ok, that’s all I wanted to tell you. If there’s anything missing from this list, please leave your suggestion in a comment and we’ll consider adding it to the list.